Oh my gosh, what a beautiful day it is here in Southeastern Pennsylvania!! Cool breezes, temperature moderate (in the 70's) and no humidity! After yesterday's soaking rains when we got more than 4" of rain, I am sitting at my window -- actually, I'm sitting at the computer, which is right in front of the window -- breeze ruffling my papers, and feeling great! With that in mind, here's one I made just playing around. I used a background from a paper pack by Kathy Davis Studios (from the local Joann Store), and two cuts from Silhouette America, for the whimsical dragonfly and the "dream big". Dropped in behind the cuts is a new product from Lovebug Creations ... it is called "Mama's Mesh" and is available in all of the colors of my favorite Rumple Ribbon. Good golly, isn't it amazing what WEATHER does to affect your mood!? 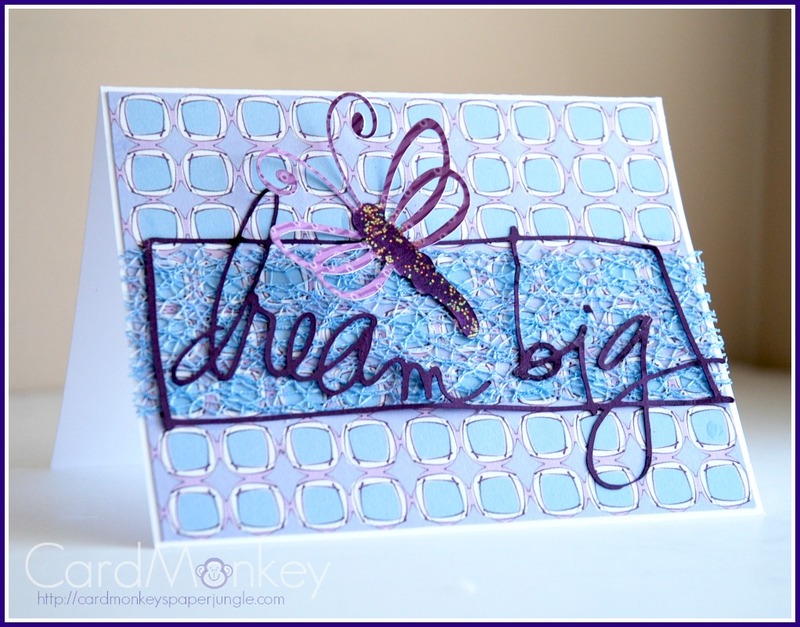 I spy some Mama's Mesh put to dynamic use - what a delightful card and such a refreshing sentiment! !